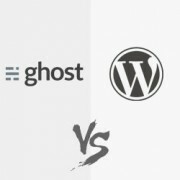 WordPress vs Ghost - Which Is Better? WPBeginner» Blog» Opinion» WordPress vs Ghost – Which Is Better? Are you looking to start a blog? Not sure whether you should use Ghost or WordPress as your blogging platform? 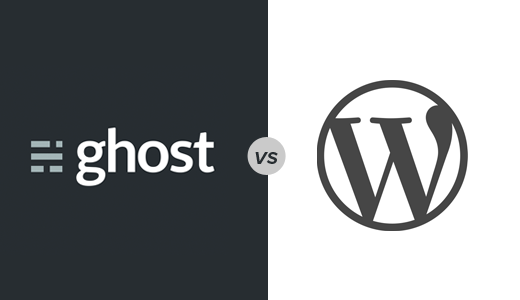 In this article, we will do a detailed comparison of Ghost and WordPress, highlighting strengths and weaknesses, so you can decide which is the better platform for you when it comes to WordPress vs Ghost. Ghost’s dashboard is very straight-forward and easy to understand. After you log in, the first thing you see is your most recent content (if you just installed it, the demo content is included with ghost. The menu has 3 options in it, Content, New Post and Settings. This makes you feel instantly prepared to go ahead and write your first post. WordPress’s dashboard has a lot more options, and might be a little more intimidating for new users. You can still easily navigate your way to creating new posts, editing content and other things, but the interface is not as clean. 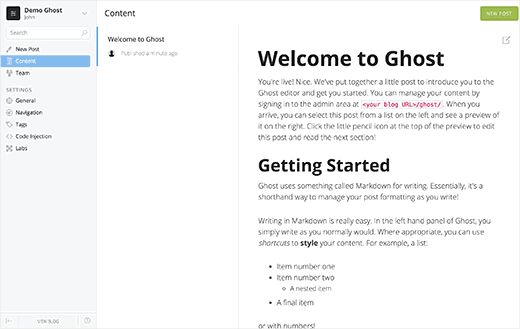 Overall Ghost’s dashboard looks slightly cleaner, and might be easier for complete beginners to get used to (except for maybe the markdown writing method) than WordPress’s, while WordPress offers more options and flexibility. 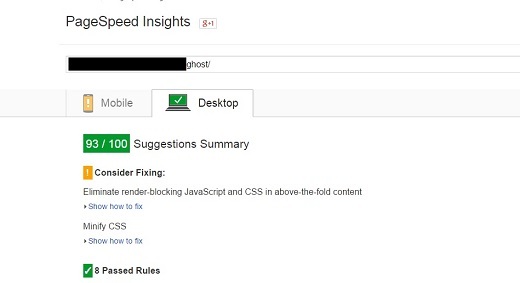 Straight out of the box, Ghost scores slightly better for speed tests and Google page insights. There is, however, little in way of beginner-friendly improvements to be made to loading speed after that point. But with WordPress, there are a lot of plugins that can help you out in this area. When you add a caching plugins like W3 Total Cache, WordPress ends up with the speed advantage. Being the veteran and more popular choice, obviously WordPress has a larger and more established community. This means that not only can you do just about anything you want with WordPress, someone else have already done it, and written a tutorial about it (hint: WPBeginner). It’s also very easy to get personal help solving WordPress related problems from other WordPress users, simply because there’s so many of them. Comparatively speaking Ghost has a smaller community and support forums. There are dedicated users that help answer questions and write some relevant guides, but there’s not the same cloud of guides, tips and ideas that you have out there for WordPress. 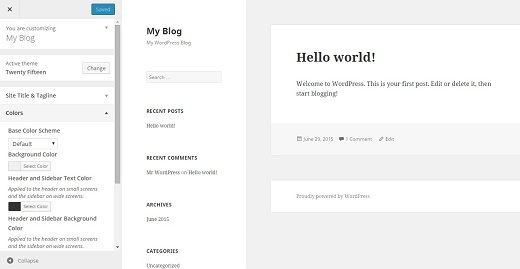 The default themes for WordPress and Ghost are not too different. Simple, functional, and beautiful. Outside of that, WordPress has a lot more variety to offer than Ghost in this department. A simple byproduct of there being a lot more WordPress themes than Ghost themes available. A great thing about a lot of WordPress themes is that you can have a surprising degree of creative control over the design of your site, without having to hard-code anything. From within the theme customizer, you can often change color schemes, backgrounds, fonts, container sizes and other things, small and big. On top of that, there are many drag-and-drop themes and plugins for WordPress that you can use to easily create different kinds of pages, from portfolio to about, to landing pages. For Ghost, you have limited options as it is very blog-centric. With Ghost, there are options for the code-savvy to customize themes, but if you don’t understand code at all, then your options are limited. One of the main selling point of WordPress is it’s flexibility. It’s an open-source piece of software you can use to easily create almost any website. You have literally thousands of themes and plugins to choose from. If you need some functionality that default WordPress doesn’t offer, there’s almost certainly a plugin for that. Maintenance mode, animated galleries, even completely functional online stores. You name it, WordPress can do it. But with Ghost, things are a little different. The team behind it designed it specifically for blogging, and only blogging. While there are Ghost themes, and some apps/APIs, they don’t really stray too far from what you might expect a stereotypical blog or blogger needs. Ghost is a beautiful solution that is great for people who want to create just a blog. WordPress is the whole package. It has great themes, plugins, and it gives you more flexibility. When all is said and done, this comparison boils down to simplicity versus flexibility. If you want to start something bigger than a blog, or at least have the option to continue building on the blog after you’ve launched, then go with WordPress. We hope this article helped you compare WordPress and Ghost, and reach a decision about which to choose for your new website. If you’ve been convinced to give WordPress a try, you can use our step-by-step tutorial on how to install WordPress. WordPress has free and basic levels while for Ghost has a high minimum price of 10x the basic WordPress. Kinda like the cool but highly priced iPhone vs a range of variously priced Androids. Ghost Admin panel doesn’t look anything like this in the latest version (0.7.2). The design is vertical, more intuitive and you see more than 3 option when you log in. You need to update your screenshot. Thanks, we updated the article.